Bali Spa It is located in Tuban, Kuta near the Airport. Jasmine Spa has 6 kinds of the spa menu and many treatments that a group of guests can take a treatment at the same time. The most popular menu is Aroma Ear Candle Massage. They put warm cotton balls with aromas into ears. They put warm cotton balls with aromas into ears. It is a unique treatment to soak up spots. They use exclusive candles for the treatment imported from China and Egypt. They sterilize ears after the massage, and put fired candles into ears. You will be amazingly surprised how much ear waxes were in your ear!!! Traditional Balinese Massage with Aroma Oil. Improving blood circulation and removing body wastes by putting warmed smooth stones on body’s massage points. This is an unique menu used a rattan in Borneo Island, and massage whole body. Remove your muscle tiredness and improve blood pressure with aromatic oil massage. A blend of Aloe Vera and green tea scrub which that refreshes the skin and body. Enjoy the touch of our well trained therapist with aromatherapy massage using Lavender oil, than Green tea body scrub which soften and brighten the skin. Continue with Aloevera Mask worked to detox a gloomy skin, make your skin softer, cleaner, healthier, radiant and youthful Aloevera also been proven to heal burns, scaly skin and remove redness. Rejuvenate yourself with advantages of Indonesian beauty essential herbs. Begins with aromatic foot bath with peppermint sea salt followed by body massage using lemongrass oil which is good for fever & muscle sore, then body polish with green tea scrub to restore & condition the skin. The treatment will finished with shower. Children can wait at the lobby or the treatment room. There are menus are available for children over age 10. 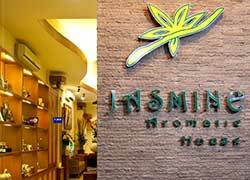 It was my first time to have spa treatment at Jasmine Spa. The spa is very beautiful. I got explanation about the products. This spa has good access to many areas in Bali because it’s located near airport.